Just days before the holidays, I spoke with Halsey Minor, founder of the cloud-based financial service Uphold. From the early days of the Internet to today’s advancements in virtual reality, Halsey has always been on the forefront of the latest technology. His latest endeavor, Voxelus, is no exception. The VR content building platform allows users to create, share and play virtual reality games and experiences without writing a single line of code, and the creations can be bought and sold with the virtual currency Voxel. In the media clip below, you can hear our discussion about Halsey’s career, Voxelus and the potential of the Voxel. Below is the full transcription of the interview for those who prefer to read. Carlo: Can you tell me about your background before you got involved with Voxelus? 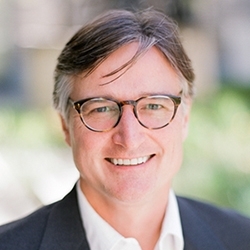 Halsey Minor, chairman and co-founder of Voxelus and chairman and founder of Uphold (formerly Bitreserve). Halsey: In the nineties I started CNET networks and I built it into a NASDAQ 100 company. I left in February 2000, and I left because I invested $19.5 million into Salesforce.com. I was the co-founder and second-largest shareholder there, after Marc Benioff. Marc didn’t run the company until the third year – a guy named John Dillon did. While I was running CNET, the software we used, it was called StoryServer and I spun it out into a company called Vignette which we owned 35% of, and they became the leading software publishing application during the nineties. They became themselves an $11.8 billion company. When I left CNET, we had $1.5 billion dollars in cash, of which $1.4 was earned and a big chunk of that came from Vignette. I started a search engine which NBC bought and renamed NBCI as part of CNET. So I left CNET in February 2000, I built it from scratch into a NASDAQ 100 company and we had 130% year over year growth rate and I accomplished everything that I ever thought I could and about ten times more. I left to help Marc work on Salesforce.com and later started a company called Grand Central, which was sold to Google as Google Voice, today it’s called Google Voice. I started a company called OpenDNS, which although I didn’t own any of it at the time, I sold it six months ago to Cisco for $680 million. [I also worked on] a couple other smaller companies, scout labs that were acquired by other companies, like Lithium. The total value of the companies I’ve founded or co-founded is now, thanks to Salesforce, over $100 billion. I founded Uphold in June 2013. I looked at bitcoin, and I looked at all that was good about bitcoin, and I saw a vision for a new monetary system, but I wanted to apply the same benefits that bitcoin brings to all the other currencies to make it more kind of consumer friendly. So I launched Bitreserve, now Uphold. We support 24 currencies, four metals, bitcoin and the Voxel, which we can talk about. It’s basically a cloud money system. You can send value around instantly, transparently at no cost. There’s no foreign exchange. When I launched CNET in 1995, there were no publishing companies in the world that were large and profitable that gave away their content. All the magazines charged and the newspapers charged. I took a big bet that I could, because my costs were lower, I could give away my content and still build a profitable company. As I said when I left I was leaving a NASDAQ 100 company. I think only us and Yahoo! were selected for the NASDAQ 100 during the nineties. When I started Uphold, it was a similar bet. We’re very different [from] just about every other company. Most companies are building payment networks. 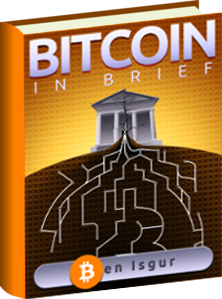 We’re building, effectively, [a] replacement for, in one sense, for the banking system. Instead of moving money between banks, which is complicated and takes time and [is] expensive and is full of all kinds of regulatory issues, we allow people to hold the money in the cloud, move it between accounts. It’s instantaneous, it’s free, we hold the money in a transparent form. We’ve been growing at an incredible pace over the last year in terms of transactions. We just added the ability to connect all bank accounts in Europe last month, and this month we allowed you to connect all accounts in the United States through ACH. As we‘ve announced, China and India are up with China UnionPay coming very soon and then Alipay. Then we’ll be announcing a bunch of mobile wallets throughout India so that the $70 billion of remittance that flows in can flow in a costless manner into all of those wallets. We have our largest outside investor. I’m the majority owner, but the largest outside investor is a guy named Ricardo Salinas from Mexico. He owns Elektra, which is really the Walmart of Mexico. A very large amount of the remittance flows through Elektra: there’s 1,600 stores. We’re gonna add what we’re calling a third raid. If you go to Elektra, you can offboard money from the United States using Western Union and MoneyGram networks, and we’re gonna add a third network. Those networks are about 9-10% of the cost. The third rail that we’re adding, you can fund your uphold account in many different ways – credit cards, wire transfer, all kinds of stuff – so I can just open an account for Pablo, send him money. He can send it to his mother and she can walk in with a QR code or our app and she’ll be able to get the money for, I believe, 2%. What’s cool about that is we cut the total cost from 9% to 2%, but Elektra only makes 1.5% with Western Union and MoneyGram, so they’re gonna make more money and we’re gonna pass about a 7% savings onto the consumer. That’s kind of what’s going on around the world, where banks kind of started locally, kind of grew up nationally, and the big problems in money flows are all international, which is why it’s so expensive. We’re really solving a lot of international money problems, although by February, everybody will be able to have a debit card, so you’ll be able to hold your money in any of the 24 currencies we support. The debit card, there will be no FX charges, which are anywhere from 3-10% depending on what card you have. We’re a monetary system and the goal is to connect every other monetary system and this is why we’re so different. You can deposit just about from any credit card into our system. You can deposit from a US bank account. You can deposit from a EU bank account. You can deposit money from, and connect, a UK bank account. You’ll be able to move money in and out of, next month, in and out of the Chinese banking system with China UnionPay integrated. The reason that we want to make it simple to get money in and out of Uphold is because, when money is in Uphold, the transactions become instant, transparent, free. Through our API we have people building apps, and so the cloud has benefits for money just as it’s had benefits for music, eCommerce and for applications. In a way, bitcoin was really the first cloud money all these servers keeping track of who has what. By extending it into dollars, euros, yuan, yen, pounds, etc., we’ve made it much easier for consumer adoption. We’re now, I believe, the cheapest way to buy bitcoin because you can connect your US bank account or European bank account. You can wire money in and you can buy bitcoin for free… and you can send bitcoin around our network for free. If you send bitcoin off of our network, it’s a 0.5% charge, but that’s still less what most people charge just for buying it. In short, we’re not a payment network. We’re a new place to deposit value that’s in the cloud. Because we don’t charge anything for transactions, we allow every transaction network to charge to us in a very friction-free way. We want to be the simplest, easiest way for you to take your money and get from any place to any other place. Our business model is predicated on you moving from one banking system and not taking it into another banking system, because you want to keep it inside of the cloud, because there you have all these wonderful benefits like free forex, instant, transparent, free, etc. The transactions have been growing at a fairly spectacular pace over the last year, and we’re just now, like I said, moving beyond bitcoin deposits to EU, UK, US and China coming. Then in the first or second quarter, you’ll be able to on and off board in 1,600 Elektra stores in Mexico, and we have other similar announcements in different parts of the world. Carlo: What was inspiration behind getting into creating a VR game dev platform? Halsey: I was one of the 10,000 people that got on the internet in 1989 through The WELL, which was a service out in Marin County, and I was in New York. The only thing you could do that I thought was interesting was this thing called LambdaMoo you could go on. LambdaMoo was a virtual world but it was all text-based. You could say, “Who’s here?” and it would list the names. You could say, “Where am I?” You’re in the kitchen. Where’s the bedroom? To the left. It was this virtual world that begged to have something more than a text-based interface. My first web experience was actually in a virtual world. It was not the web. It wasn’t until 1993 that I saw the web and decided that I would launch CNET as an internet web-based service. When an employee of mine left to start their dot-com, which was a virtual world – I gave him a little bit of money to do that – one of the most influential books that I’ve read was a book called Snow Crash that came out in 1993. The Matrix is kind of based on it. It was all about virtual reality and there was a virtual currency called the Kongbuck. The other great irony is when I was starting CNET in 1993, nobody was talking about the internet. Everybody was talking about virtual reality. I went to SIGGRAPH in 1993 and NASA had a VR station and you’d put on the glasses and you could either see a triangle or circle, that was it. Just that was really cool, that you’re moving around and looking, but it was so very basic. There was a guy named Jaron Lanier and he was really kind of the celebrity of the moment in tech, and he was at MIT and he was talking about virtual reality. The pages of Wired were filled with virtual reality in 1993 while I’m trying to build this internet company. So it’s always been an area that’s held a great deal of interest to me. When the internet came along and I started CNET, it was really the replacement of traditional, text-based publishing, whether it’s newspapers or magazines, etc. When I ran CNET, I also had five tv shows. I had four on USA and Syfy that were all about technology. Two of them were hosted by Ryan Seacrest; his first two shows were for me at CNET. I had a show on CNBC called News.com which was a tech news show. From 1995 until 2000 when I left, we produced these shows, they started out being a big chunk of our revenue. 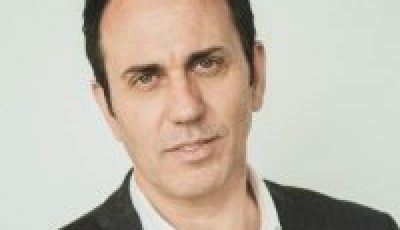 But by the time I left, the $5 million a year we got in license fees for television was a very part of our overall revenue because the internet side was many times bigger. I’ve not only built this internet company, but I did it while also being one of the largest producers of content for television during the time. I knew nothing about television, but I hired a great group of people who had all really built out programming on the Fox network. At the time, the CEO and Founder of USA network was ahead of her time, so she wanted to do all this tech programming, and we were the first people to have a URL on tv. So I thought about tv, virtual worlds literally since the beginning of my career. When Oculus first burst onto the scene, I started paying attention to what they were doing. Around the time that DK2 came out, or just before that, I came to the conclusion that this was finally gonna be real and that a lot of the problems, which were really around processing power, had time to be solved. There was a group of guys that I’ve known, worked with in the past, who were in Argentina, and we decided that we would create a service that would allow people to be able to build worlds in VR, experience those worlds and that we would open the platform up so people could create content, sell content. Virtually any kind of world could ultimately be built and games could be played. So it, in many ways, takes a lot of the concepts that I think are now gonna be part of gaming, which are in Minecraft, which is the idea of people having control over their own environments. Unlike Minecraft, which has a specific aesthetic, we allow people to choose lots of different forms of content. When our marketplace opens in March, anyone from Disney can add content to people who just build a cool gun or car or spaceship. In so doing, we can try to take what, say took 3 years at YouTube, where they went from being a place where you could put videos to being a place where you could earn a living, why don’t we try to compress that down so that we’ll create a marketplace for content, and we’ll create a whole ecosystem. Somebody asked me, “Why did you use a currency that’s not the currency that your users use?” and the thing is that Voxelus is a fully global business. There is no one currency that everybody in the world uses for games. We’re gonna have people who have pounds, who have euros, who have dollars. Who have, because of Uphold… can have currently 24 different currencies that they can use to buy what are called Voxels. The idea is that there is a currency which you will be able to buy very easily, unlike most altcoins. 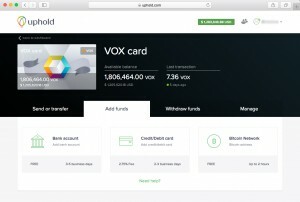 Uphold is building the system for you to be able to either send money from your bank account in the US, UK or Europe, or e-credit card, equal to China UnionPay, to buy Voxels, so they’re very accessible. That becomes the currency of the land. The people who accept Voxels for their content, they can use Uphold to convert them to dollars or euros or whatever their local currency is. The goal is to really accelerate the choice of options for content by creating an economic system that rewards people who spend time building really cool content. So we have a lot content now that we’ve created that will always be free, but we also want to encourage individuals. We’d love to see Star Wars walkers and spaceships and all that sort of stuff. I do believe, because VR is so new and it’s not very big yet, that long before brands spend $20-30 million on a VR title, they’re gonna take their assets and upload them into Uphold and see what people do with them. If you’re the movie Fast & Furious, you’re much better off putting your cars and stuff in Voxelus and letting people buy them and make them part of games than you are right now trying to guess what would work in a $30 million VR title. So I think, while it works for individuals to be able to create content, it will also work for large, branded content providers early on as people try to figure out what really does work. I was in a position to take these two companies and create something unique and special, which is what happens in March when we launch the marketplace, powered by the Voxel. It’ll be very easy for people to buy Voxels. It’ll be very for people to convert Voxels to other currencies. 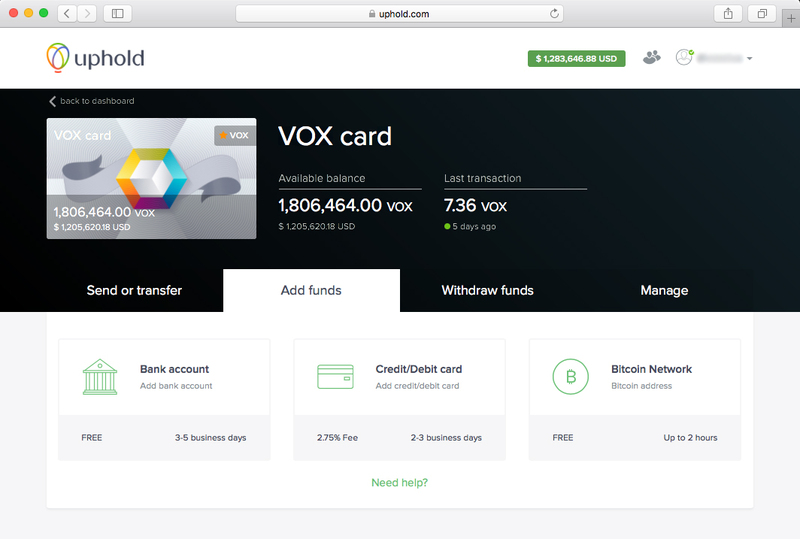 Uphold will probably have debit cards around February, and you’ll be able to hold your money in Voxels and still buy stuff. If you’re in Europe, we’ll convert your Voxels to euros. If you buy stuff in the US, we’ll convert your Voels to dollars to pay your credit card bill. Like all things on Uphold, there will be no exchange costs. This is the first in-game currency that really stands on its own as a currency. The definition of a currency is that it’s the form of value that a government allows you to use to pay your taxes, that’s kind of at the heart of what is a national currency. That kind of forces everybody in the US to use dollars because everybody’s gonna be paying their taxes in dollars. I started thinking, “If we have 100 million people who use Uphold, which is possible, and they’re buying content, that’s like a large country.” There’s no reason why it can’t have, as a virtual place, it can’t have it’s own currency, which would be a virtual currency. All the piece seemed to fit together into this nice, tight idea about creating virtual worlds and enabling people to hopefully earn money doing creative things that support the larger community. Carlo: I’m a bit of a gamer myself, so I found that quite interesting, looking through and seeing the potential that’s there for ways people can interact. It’s also exciting, too, because it is virtual reality. Like you were saying, this is something that people were preoccupied with 20 years ago and now, finally, it seems feasible. The coolest thing I’ve done so far, I downloaded and I built a world and I jumped into it with my Galaxy Gear phone and all of the guys in Argentina did, and we ran around together. It is the most mind-blowing thing I’ve done in my career in technology. Now in the new version we’ve added gestures. We were using Skype to talk but we’ll support full audio by January. It’s really a gamification platform, so you’re racing to flags, there are guns, you can have shooters. It’s really wide open in terms of the kinds of games you can play. It basically turns on the creativity of everyone around the world ot build VR games. The problem with VR is that you get your Galaxy gear thing and within an hour you’ve kind of gone through it all. The benefit of Voxelus is that we’re gonna have people who are gonna be building hundreds of thousands, if not millions of different worlds. As long as we build a good system for discover, we’ll feed a lot of the content necessary for VR to be sustaining. Carlo: Can you tell us more about the private presale? Halsey: The goal was to pre sell up to 30 million Voxels prior to the marketplace opening up in March. The most important thing for me is that this isn’t one of those things where you get a very high price for an altcoin and then it spends the rest of eternity going down in value. Because the Voxel is the only currency accepted, every time somebody wants to buy Voxels, that is a trip to an exchange to buy Voxels. The more people who Voxels, the more the exchange traded value will exist. The goal was to create a currency whose utility and value goes up over time, and the value goes up in time because the utility goes up over time. As we add more and more content, and there are more and more buyers, all of those acquisitions happen because the mechanism for doing this is being built by Uphold, and we’re selecting exchanges right now. When you go and you got your China UnionPay or your MasterCard or American Express or bank account and you buy Voxels, that’s gonna be a trade that happens at our exchange partner. A lot of altcoins kind of languished because there’s no need other than speculation. I didn’t want to build a speculation coin, I wanted to build a utility coin. I have this theory, which bitcoin has sort of informed, and that is we’re going from currencies we were born into to currencies we believe in. Bitcoin is the first currency that has no geography but it has a bunch of people who believe in it. I don’t think that’s the final word. I think there’s no reason why we can’t have currencies we believe in just as there are currencies that we have geographically, that we grew up with. The idea was to create in Voxelus, essentially, the currency of VR and the currency that other people can use on their platform, we had to choose some form of value. I could have chosen the dollar like everybody else does and made it, once again, the reserve currency of the world, but we’re creating our own worlds, and they need their own set of money. My hope is that the platform is successful and more and more people use it and more and more people buy content. The more and more people who buy content, that means the amount of value traded on the exchange has to go up. It’s that attribute that, I think, separates it from almost all other altcurrencies. The fact that we have made it the only form of value that can be used, and we have made it so accessible because people can use virtually any credit card or bank account to buy it. 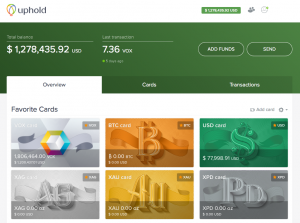 A lot of the altcoins you can only buy with bitcoin, but the Voxel you can buy with any credit or any bank account. The cost of converting euros into Voxels is free. I wanted to create sort of the ultimate game currency. For years, people have been able to accrue game currencies, but it hasn’t had any value outside of the game. I wanted to say, “Hold on a second, what difference is your work in the United States or Europe building something than your work in Voxelus building something?” Why should one form of labor be eligible for compensation and currency and the other not? It’s kind of like a flag that says there’s a different way of doing this. These emerging virtual worlds that are gonna have their own emerging virtual currencies are gonna have their own emerging virtual economies. I just happen to be in a unique position to be able to make that happen. You have to kind of look at it differently. The emphasis was not necessarily on the upfront sale of the currency. The emphasis was really around the making sure we got a marketplace that launches, that we have a currency that is as useful as the dollar is. If I want, in February, if I want to put $100 on a platform and convert it to 100 worth of Voxels, I can use it with my debit card, just as I can use the dollar. 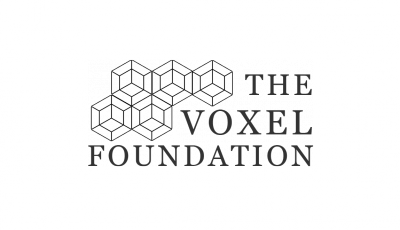 The goal is to make the Voxel indistinguishable from the dollar in its capabilities. That’s what I’m playing for. To me, the coolest outcome of all would be to say, “You know what? Money can now be something that I just believe in that’s a vertical market, and it doesn’t have to be the thing that I’m literally born into.” I think that’s really profound idea. Is it gonna work? Whether is works is really gonna be dependent on the adoption of Voxelus over time. I think if Voxelus does as well as I think it will do, then I think it will create a lot of demand for the currency and I think the currency will be very successful. If Voxelus doesn’t do well, then I don’t think I’m gonna get a chance to prove the sort of alternative reality for money. What gives me confidence is, considering how early it is, Voxelus is a good platform already and you can do some pretty cool stuff. We support Samsung Galaxy Gear. We supported Mac and PC with Oculus, but Oculus just dumped supporting the Mac platform, which I think is crazy, so that forced us to dump it. We’ll be supporting maker VR and some of these other guys who are coming out. So very broad support. Carlo: You just mentioned something that I wanted to ask you about. The platform that people are actually interacting with. Just looking at the site I was seeing more screenshots and seeing what’s able to be done. Halsey: Download the builder and see what you can do with it! I know an eight-year-old can do it. My sister has an eight-year-old and he built worlds on it with his friends. It’s actually a really simple tool. It’s that classic thing, right? You want to make it as simple and powerful as possible at the same time. You’re always kind of walking this fine line between getting incredible power, and at the same time not making it daunting for an eight-year-old to be able to use. Eight-year-olds and ten-year-old are probably gonna be the ones spending hundreds of hours building stuff. I think the newest version that’s out now, you don’t even need VR. You can just, as you’re building your world, you can play it. So there’s a VR and non-VR version. The builder will let you just jump right in and play as if you’re playing Minecraft. 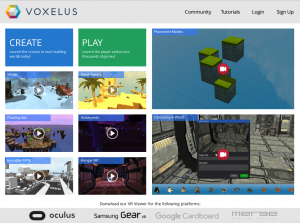 If you have the Galaxy Gear phone … you can go to Galaxy gear and download the Voxelus player, put your name and password in, and then all the games you built will be available on your phone wirelessly. It works really well. It’s undoubtedly going to be, if not already, one of the leading applications in VR. We just added, because Oculus has greater capacity than the Samsung VR, I think this version has a slider in that shows you, as you’re building your world, if you’re bumping up against the capacity of Samsung VR, if you want to publish to that audience. Or if you want to publish against Oculus, you can build an even greater world. Those limitations are gonna be a very fast-moving target as phones get faster. There’s a lot of incentive now for GPUs on them, and PCs, once again, have a very strong incentive for faster and faster GPUs. It’s very accessible to just try it and the currency is going to become super accessible in March. I can’t wait for it to launch and people to see how it works. Carlo: Through our conversation we actually touched on pretty much all the other questions I had. I don’t know if you had anything else that you wanted to add on your own, just about Uphold or Voxelus or anything else. I’ve been doing this since 1993, and this is the most exciting moment since I’ve been doing this. The information revolution I think really made a lot of lives better, let us buy cheaper stuff and made us better informed. I think it pales in comparison to the fintech revolution. I think it’s kind of profoundly important from just an overall standard of living [perspective] and equity around the world, even more so than the information revolution that was kind of the nineties that I participated in. And then, the web and CNET was all about replacing magazines and newspapers, and now it’s about replacing television. I think there’s just some really, really, really cool stuff that’s gonna be happening over the next year.